When I was pregnant with Sofie, I traveled to see an old friend from high school. 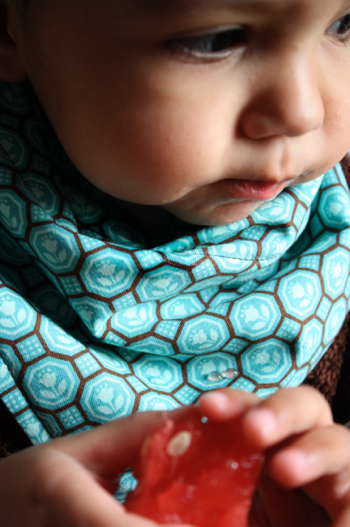 She gave me several gifts while I was there, but one of the things was these bibs made from washcloths and handkerchiefs. “These are a novel idea” I thought. But shamefully, I didn’t use them. Sofie is the neatest eater I’ve ever met. I could dress the kid head-to-toe in white, give her chocolate cake, and she’d still be spotless at the end of her sugar binge. It’s mindblowing. But then came Chloe. She’s definitely the messy kid and we’re pretty convinced she doesn’t approve of a meal unless bits of it are shoved in every nook and cranny on her body and properly smeared into her clothes. I was stripping her down to her diaper to eat, but that gets awkward at restaurants and in public places. So I remembered the bibs my dear friend had given me and they were a lifesaver!! She made me 3 and I was going through them faster than I could wash them. So what’s a girl to do? Make more, of course!! I didn’t have any handkerchiefs, but I did have plenty of scraps of fabric to choose from and I grabbed cheapy washcloths from Walmart for like $2 each. 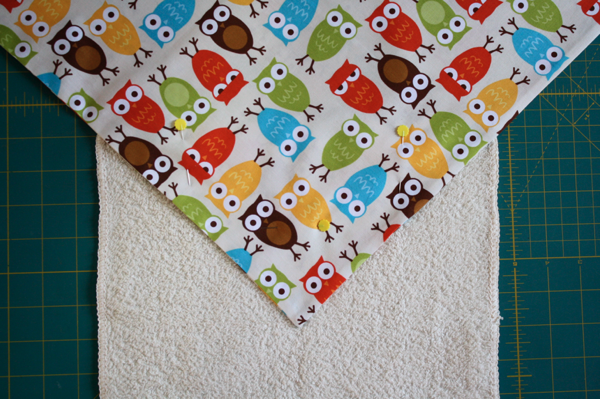 It only took me a few minutes to whip up each bib, and trust me, they’re AMAZING gifts! As soon as I got done sewing, I tried them out on Chloe for snack time. We were having watermelon and she was happy to oblige me in a little photo shoot while she ate! Look at those delicious cheeks!! 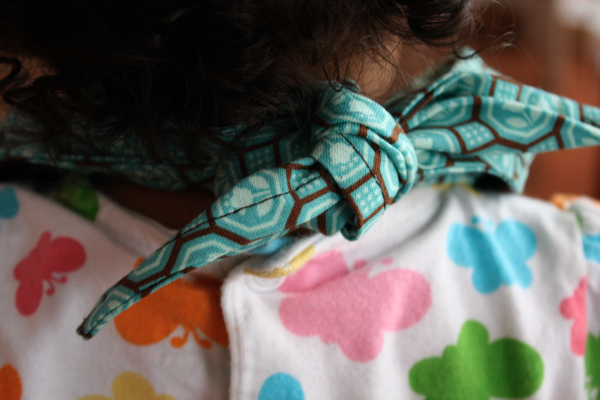 The edges tie nicely around the neck, preventing the typical yank-my-bib-off behavior we all know and love. You might think a washcloth isn’t good coverage for a kid, but you can see it’s actually quite large on them, and leaves plenty of room to grow! So, you want to make your own? Fantastic! 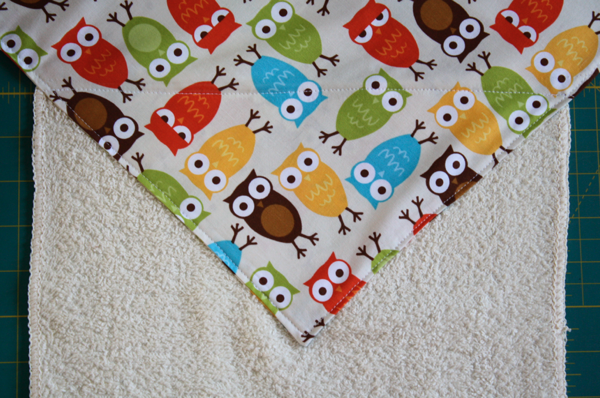 All you need is a washcloth and a piece of fabric 18″ to 19″ square. It doesn’t have to be any exact size, something around that range will work. 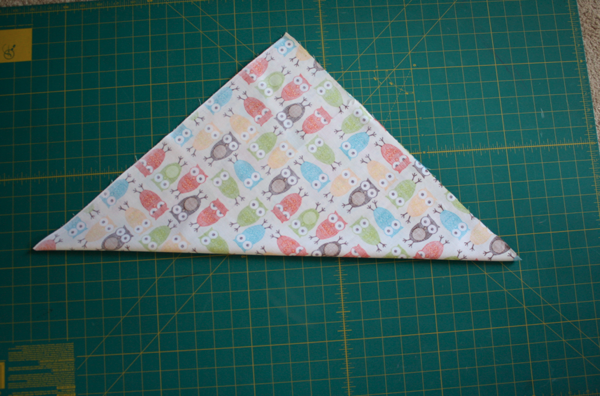 Take your fabric and fold it in half, right sides together, on the diagonal. leaving a hole a few inches long to turn it through. 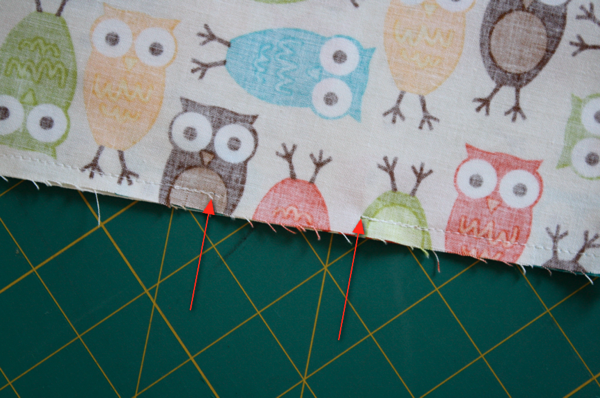 Seam allowance doesn’t really matter, whatever you prefer, but I used 1/4″. Turn it right side out, poke out the corners, and iron flat. Place the fabric on the washcloth, making sure the point is centered. Pin in place. 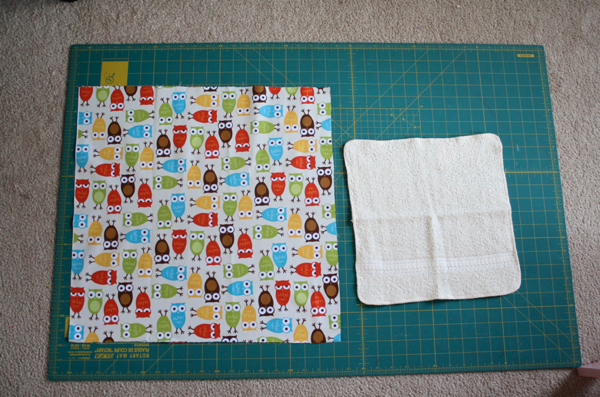 Sew down the 2 sides, attaching the fabric to the washcloth. 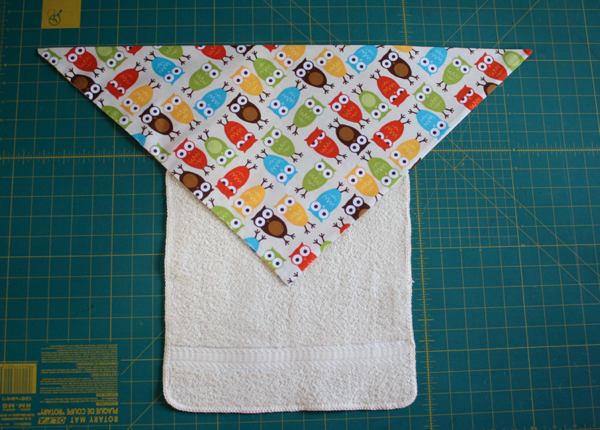 Then sew across the top of the washcloth to finish off the bib. Quick, easy, and totally useful! And perfect for feeding those hungry little honey’s in your life! SO adorable! And quite a few of my friends are having children these days, so I’ll be whipping up a bunch of these! Thank you! I love this design! It’s super cute and so, so useful! Thanks tons, I’ll be linking. 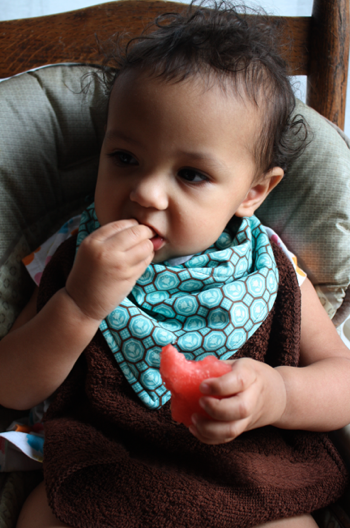 We like to make bibs with decorative fingertip towels, too. We make them for all sorts of seasons and holidays. Not only do they cover better than the bibs you buy in stores, they are thicker which equals better clothing protection and the terry cloth washes well which means the bibs aren’t all stained and nasty looking like store bought bibs. And you know what’s so funny is my plan for next week’s post on Notes She Wrote was going to be to do a tutorial on how to make these! Looks like I might just link over to you. This tutorial is fabulous as always!! Great post! Love your site…just wish I had all this talent. omg. I saw these before somewhere and I loved them and now I found this tutorial. I’m having a baby boy in a few weeks and I think these will look super cute! Those are awesome! 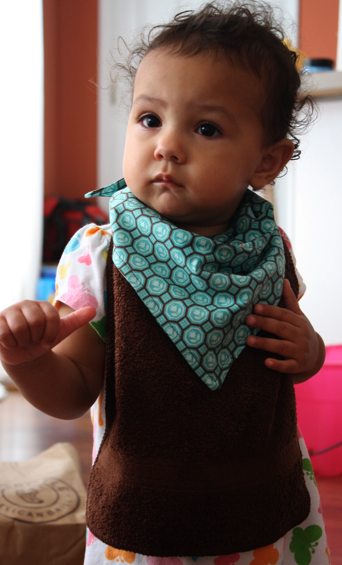 Such great bibs with NO velcro or snaps! What a terrific way to blow through some of that fabric stash! Those are awesome. 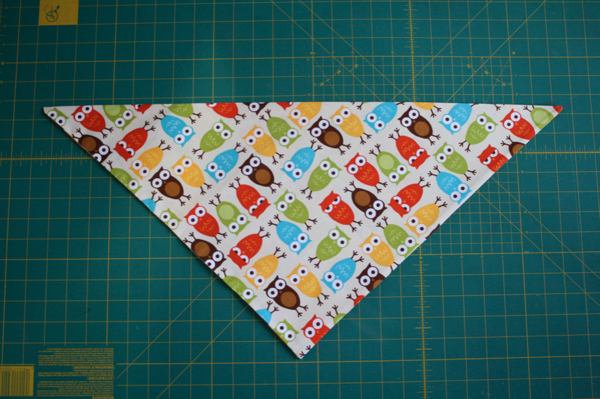 So cute and no fasteners to sew on! This is so ingenious! I will totally, totally be making some of these! Thanks for sharing! Just found this site tonight and loving it. 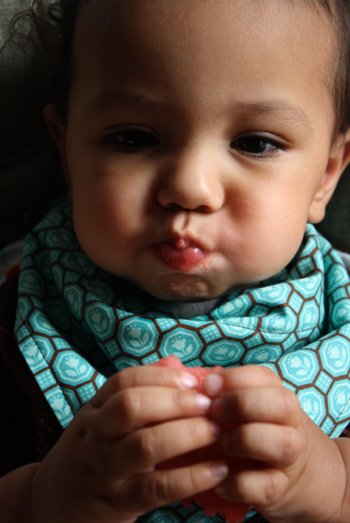 I usually make bibs as gifts and I LOVE this one. TFS! Finally a sewing project that I think I can manage!!! I’m very excited to try this. So happy to have found your blog! These are too cute. I just had to make a couple for my twin girls. They will not keep a bib on. They couldn’t get these off haha! Thank you for sharing how to make them. I love all your stuff!!! You are amazing! sharing these creations and helping others to make them for their own kids (and in my case my neice as well since I don’t have a girl! ), Very kind of you! Thank you for such a wonderful tutorial! I’ve made these for a friend for her son’s 1st birthday and I just whipped out five more this morning for my 6 month old…. she’s started eating solids and is just plain messy! Can’t wait to use these on her! Thanks SO much for this tutorial! I’m a returning seamstress, so I wanted a quick, easy but practical gift for a dear friend – this fit the bill EXACTLY – I love the name of your blog because I want to “sew like my mom” – I don’t have her gift – just her persistence – thanks again. I love your site and your tutorials. 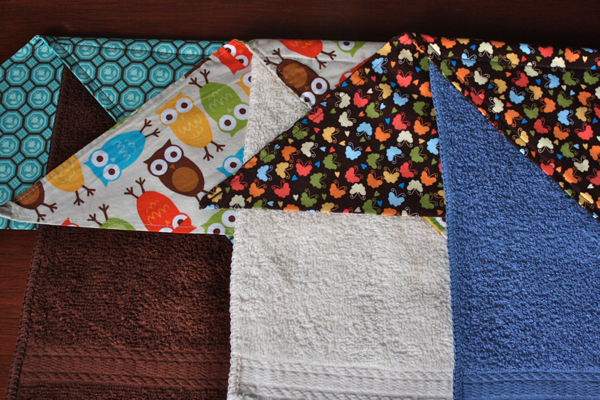 I just used this tutorial and blogged about it here: http://fourboysandanlgirl.blogspot.ca/2012/06/deadlines.html . Good luck with the party prep. I am doing the same for my two big boys on the 7th. Eek! 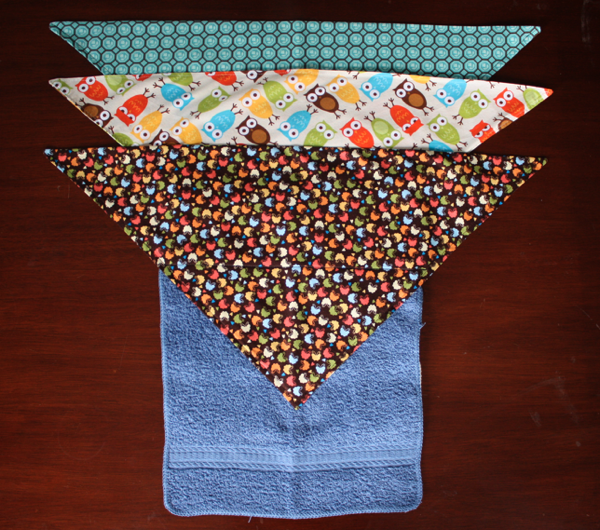 These could easily adapted for an older child or disabled adult by using hand towel and bigger triangle. These are too cute! How far do you come down on the washcloth? Do you have a picture of the backside to determine this? Got LOTS of fabric and washcloths to use up! Thanks! Thanks! 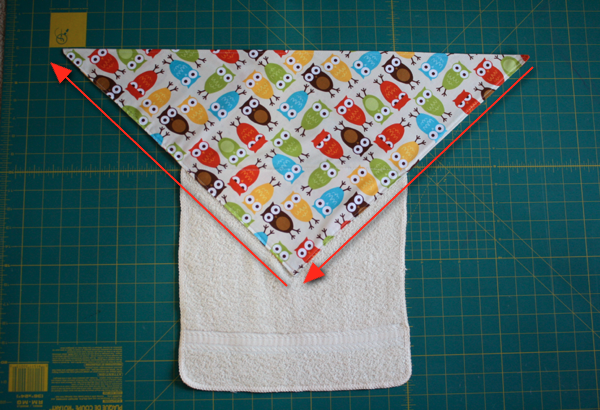 I don’t have a picture of the back, but basically I just line it up so the corners of the washcloth meet the sides of the triangle. This is a keeper for sure. Have five babies and a set of twins to sew for before October this will be in the gift basket for sure!!!! Thank you from babies to be! I love this idea. My observation is…there seems to be a lot of material around the baby’s neck. Is it as bulky as it looks? My question is…how could you limit how much material is around the neck? Maybe using velcro or an snap instead of tying? I want to make a bunch of these for my grandkids but don’t want so much material at the top. Thanks for any help. BTW…Love your blog and tuts!! 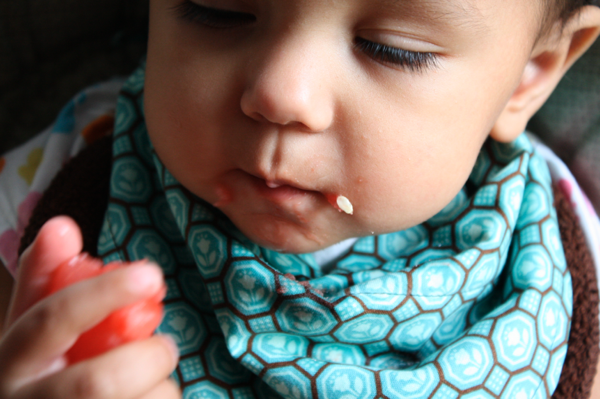 It’s not an overly huge amount of fabric, and honestly, it does a REALLY good job of keeping food from being able to drip off baby’s chin or fall out of their mouth and go between the bib and body and down the front of their clothes. You can eliminate some of it by changing the angle of your triangles, but I wouldn’t. I’ve used these bibs on 3 kids and none of them complained about the bulkiness, it’s mostly just bunched a little. And like I said, it keep them dry! I was able to lighten the amount of fabric around my grandson’s neck by using just one (1) layer of fabric for the triangle. 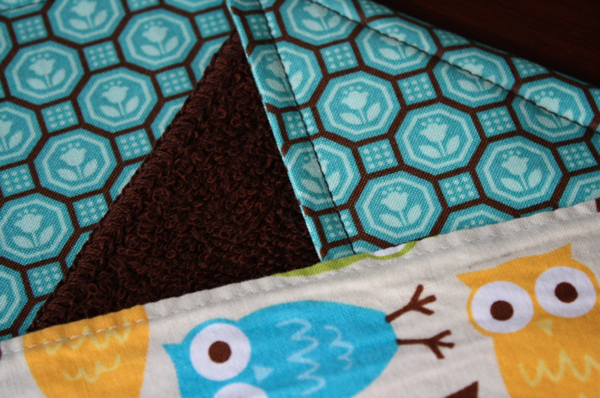 I first narrowly hemmed the edges of the triangle before attaching the washcloth. He’s only 10# but needs numerous bibs each day for frequently spitting up large mounts of milk all over himself. The large washcloth has saved him (and our laundry) numerous times! 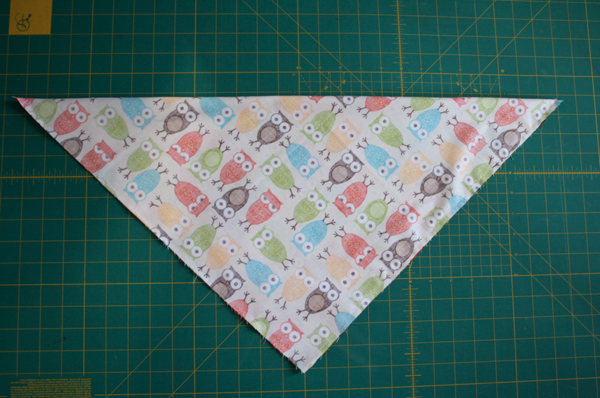 Just made a few more today, these are great and like everyone else they better than bought ones (and easy to sew). I have made some for our child care centre, these will have press studs. Thanks love your work!